Although rare these days, getting there can still be half the fun. How, you ask? Travel via Abu Dhabi and stay a few days at Qasr Al Sarab (www.qasralsarab.anantara.com), a surreal romantic resort managed by Anantara and located 90 minutes from the city amid the massive golden sand dunes of the Liwa desert (shown at left). 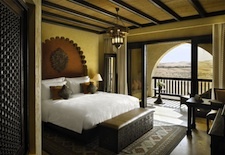 With a “Stay 3, Pay 2” promotion throughout 2011, a stopover at this luxurious oasis is a terrific deal. I had a chance to spend three nights here recently and sample a mix of modern Arabian luxury and exotic Bedouin tradition – with a touch of Asian spa expertise, courtesy of Bangkok-based Anantara – and the combination was both visually and experientially intoxicating. Abu Dhabi (www.visitabudhabi.ae), the capital of the stable and fast-developing United Arab Emirates, makes a great gateway and stopover point if you are heading to India, Africa, or Southeast Asia. The country's award-winning, state-of-the-art airline, Etihad Airways (www.etihadairways.com), flies daily 12-hour nonstops from New York to Abu Dhabi and several nonstops a week from Chicago and Toronto, with connecting service to cities such as New Delhi, Cape Town, Bangkok, and Singapore. Abu Dhabi is a fascinating, modern, and safe city (the U.A.E is just 40 years old this year) with intriguing cultural and leisure developments on the near horizon. Architecturally stunning outposts of the Louvre, the Guggenheim, and the British Museum (in a partnership with the Zayed National Museum, a tribute to Sheikh Zayed bin Sultan Al Nahyan, father of the U.A.E.) – designed, respectively, by Jean Nouvel, Frank Gehry, and Norman Foster – plus a Performing Arts Centre by Zaha Hadid, are set to open on Saadiyat Island (www.saadiyat.ae) over the next three years, and most major luxury hoteliers are building properties. For relaxation, couples seeking romance should definitely head out into the desert to embrace the essence of Emirati history and culture. Qasr Al Sarab, which translates to “Mirage Palace” in Arabic, sits in the Liwa desert’s Rub al Khali (Empty Quarter), the world’s largest uninterrupted body of sand, about 10 miles from the Saudi Arabian border. You arrive on a winding, narrow road that snakes through graceful, towering dunes and leads across a lantern-lit bridge to the fortress-like resort, designed to capture the grandeur of the ancient forts of Abu Dhabi and Al Ain. Built over three years by 5,000 workers and opened in October 2009, the one-of-a-kind property features 154 rooms, 42 villas, and 10 royal villas. Its public spaces are decorated with hundreds of museum-quality artifacts (camel saddlebags, pottery, artwork) from the region, which gives it an exotic, eclectic aura – there’s something interesting to look at around every corner. 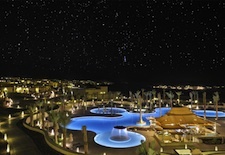 All accommodations offer views of the spectacular dunes, which will mesmerize you from dawn till dusk – and even after that as the clear desert skies allow the moon and stars to illuminate the landscape like a scene from One Thousand and One Arabian Nights. (Jet-lagged, I kept waking up at all hours and peering from my balcony at the scene as the dunes changed hues, which actually made my insomnia sort of tolerable.) Even the smallest rooms, Deluxe Balcony Rooms (shown at right), are a generous 430 square feet with spacious bathrooms featuring dual sinks, a deep-soaking tub the size of a small plunge pool, and a separate shower. The Arabian-inspired décor of dark, carved-wood furniture and latticework, hand-woven carpets, and silk pillows in rich tones sets a seductive tone, and the king-sized beds are topped with crisp white luxury linens. Tip: The midday heat offers a great excuse to retreat here for a romantic nap à deux. At meal times, you’ll want to try all three of Qasr Al Sarab’s wonderful restaurants. Breakfast is served at Al Waha, a buffet eatery where you’ll find options both familiar and foreign. The omelets and pastries are amazing, but be daring and try the traditional Bedouin breakfast of camel’s milk and dates (it’s rich, sweet, and satisfying) or the savory breakfast bean stew called “foul” (it reminded me of chili). Return to Al Waha for an amazing lunch buffet. The tasty breads and freshly made salads and vegetable spreads alone, from tangy humus to zesty seafood salads and every roasted vegetable imaginable, were so delicious I never even made it to the hot buffet. If you are sunning poolside, you can opt for the adjacent Ghadeer, which offers salads and sandwiches à la carte. 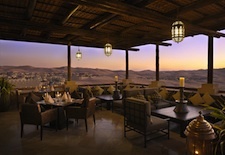 Be sure to book a dinner at the exquisite rooftop Suhail, named for the star that Bedouins used to navigate the desert. Enjoy sunset cocktails on the terrace (shown at left) before heading inside to savor a multi-course fine dining experience, featuring fresh grilled fish and meats with distinctly French influences (foie gras, truffles, and caviar). The culinary magic is miraculously transported to this oasis in the middle of the unforgiving desert by Qasr Al Sarab’s innovative Executive Chef Ed doukani Az Taj, whose culinary background includes Alain Ducasse restaurants in Monte Carlo and Nobu in Miami. For a more casual but equally romantic dinner, the mood and the menu at Ghadeer transform post-sunset to candlelight and local cuisine (tasty mezes, mixed Arabian grill, hammour fish) and be sure to finish with the rich, creamy, and totally decadent camel’s milk crème brulée. To truly unwind, indulge in Arabian beauty secrets abetted by Thai massage expertise at the sanctuary-like Anantara Spa. I suggest you enjoy a cleansing and revitalizing Royal Hammam Ritual for two, followed by side-by-side, 90-minute Arabian Massages incorporating aromatic oil and elbow pressure to stimulate circulation and release muscle tension. For silky smooth skin, book an Arabian Exotic Scrub, which uses a rich mixture made from dates to exfoliate and moisturize – it left my skin feeling so soft and glowing I thought I was in my 20s again! While it might be tempting to lounge all day (and even at night) in a comfy chaise or daybed alongside Qasr Al Sarab’s large, free-form pool (shown at right), you should join the knowledgeable and friendly activities team to experience the pleasures of the desert. Head out at 6am for an invigorating sunrise desert walk (it should be called a trek, as the walk is up the steep dunes) to see the shifting sand patterns up close and perhaps spot a sand gazelle or two. At sunset, opt for a relaxing Camel Trek (shown below at left) – though know that mounting and dismounting is a bit of an adventure. Compete one-on-one at Archery (a long-held Arabian tradition), and learn about falconry, a sport revered throughout the U.A.E. (the birds sell for thousands of dollars, have “passports,” and can travel in the cabin on Etihad), which the resort plans to add this year. End the day with an Arabic Sitting, as you relax on pillows beneath a Bedouin tent while sipping coffee or tea and nibbling on honey- and date-filled sweets. It’s all rather magical, just as you imagined a place called “mirage palace” would be. Summer temperatures can reach 125 degrees Fahrenheit, so the best time to visit is October to May when daytime highs are more comfortable (75 to 90 degrees) and nights are refreshingly cool (50 to 60 degrees). Qasr Al Sarab provides limousine transfers from Abu Dhabi International Airport ($147 each way), and with the “Stay 3, Pay 2” promo, room rates start at $282/night, including breakfast. See our Abu Dhabi Travel Guide for general trip-planning information, then use our Travel Search price comparison tool to find the lowest rates on flights, hotels, packages, and more travel deals.